(Nanowerk News) In a recent paper published in Nature Nanotechnology ("Nanotube mechanical resonators with quality factors of up to 5 million"), Joel Moser and ICFO colleagues of the NanoOptoMechanics research group led by Prof. Adrian Bachtold, together with Marc Dykman (Michigan University), report on an experiment in which a carbon nanotube mechanical resonator exhibits quality factors of up to 5 million, 30 times better than the best quality factors measured in nanotubes to date. Imagine that the host of a dinner party tries to get his guests' attention by giving a single tap of his oyster spoon on his crystal glass. Now, imagine, to the amazement of all, that the crystal glass vibrates for several long minutes, producing a clear ringing sound. Surely the guests would marvel at this almost never ending crystal tone. Some might even want to investigate the origin of this phenomenon rather than listen to the host's speech. The secret of such an imaginary non-stop vibrating system relies on the fact that it dissipates very little energy. The energy dissipation of a vibrating system is quantified by the quality factor. In laboratories, by knowing the quality factor, scientists can quantify how long the system can vibrate and how much energy is lost in the process. This allows them to determine how precise the resonator can be at measuring or sensing objects. Scientists use mechanical resonators to study all sorts of physical phenomena. Nowadays, carbon nanotube mechanical resonators are in demand because of their extremely small size and their outstanding capability of sensing objects at the nanoscale. Though they are very good mass and force sensors, their quality factors have been somewhat modest. However, the discovery made by the ICFO researchers is a major advancement in the field of nano mechanics and an exciting starting point for future innovative technologies. What is a Mechanical Resonator? A mechanical resonator is a system that vibrates at very precise frequencies. 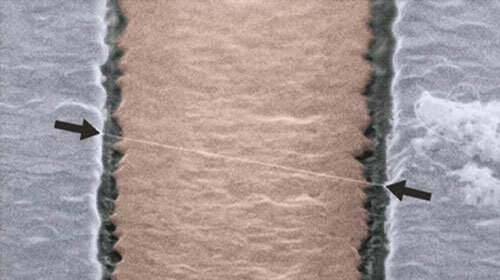 Like a guitar string or a tightrope, a carbon nanotube resonator consists of a tiny, vibrating bridge-like (string) structure with typical dimensions of 1 µm in length and 1nm in diameter. If the quality factor of the resonator is high, the string will vibrate at a very precise frequency, thus enabling these systems to become appealing mass and force sensors, and exciting quantum systems. For many years, researchers observed that quality factors decreased with the volume of the resonator, that is the smaller the resonator the lower the quality factor, and because of this trend it was unthinkable that nanotubes could exhibit giant quality factors. The giant quality factors that ICFO researchers have measured have not been observed before in nanotube resonators mainly because their vibrational states are extremely fragile and easily perturbed when measured. The values detected by the team of scientists was achieved through the use of an ultra-clean nanotube at cryostat temperatures of 30mK (-273.12 Celsius- colder than the temperature of outerspace!) and by employing an ultra-low noise method to detect minuscule vibrations quickly while reducing as much as possible the electrostatic noise. Joel Moser claims that finding these quality factors has been challenging since "nanotube resonators are enormously sensitive to surrounding electrical charges that fluctuate constantly. This stormy environment strongly affects our ability to capture the intrinsic behavior of nanotube resonators. For this reason, we had to take a very large number of snapshots of the nanotube's mechanical behavior. Only a few of these snapshots captured the intrinsic nature of the nanotube's dynamics, when the storm momentarily relented. During these short, quiet moments, the nanotube revealed its ultra-high quality factor to us". With the discovery of such high quality factors from this study, ICFO scientists have opened a whole new realm of possibilities for sensing applications, and quantum experiments. For instance, nanotube resonators might be used to detect individual nuclear spins, which would be an important step towards magnetic resonance imaging (MRI) with a spatial resolution at the atomic level. For the moment, Adrian Bachtold comments that "achieving MRI at the atomic level would be fantastic. But, for this, we would first have to solve various technological problems that are extremely challenging."